October | 2015 | Does This Font Make Me Look Fat? 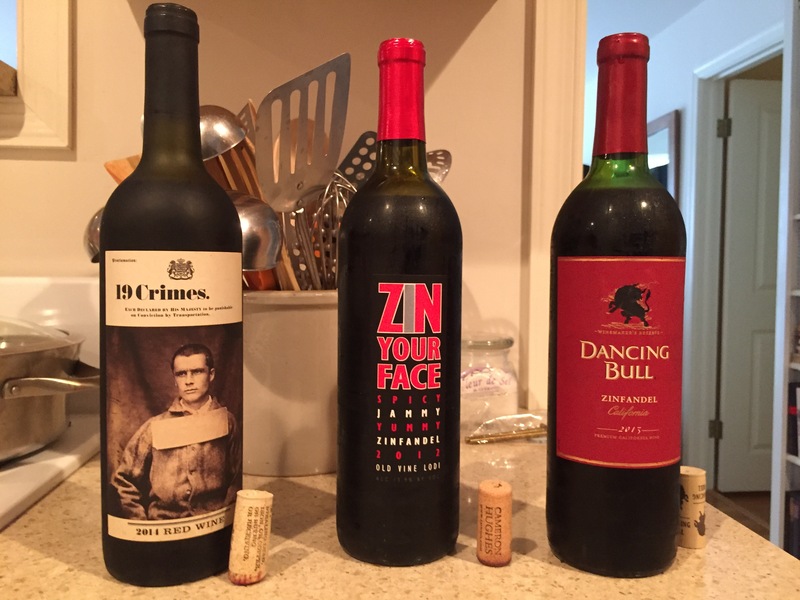 I like red wine, and my favorites are Zins. Lush, jammy, fruity Zins. 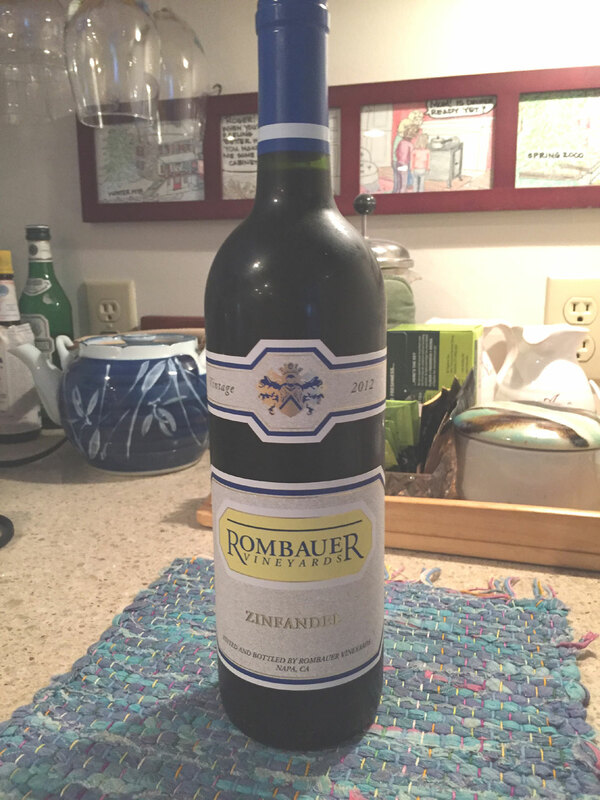 And the one that literally makes me smack my lips is Rombauer Zinfandel. Unfortunately, it’s almost $29 a bottle at our local liquor store so it’s saved for special occasions. My birthday, Christmas Eve, New Year’s Eve. Selling a script…still waiting to open a bottle for that reason. Having a best selling novel…still waiting. Finishing the third book in my Caribbean romantic paranormal series…that might actually happen in the spring and there’s a bottle of Rombauer waiting in the wine fridge. My husband usually drinks white wine and he’s quite happy with Yellow Tail Chardonnay which is cheap. So I’ve been looking for something cheaper to drink since I usually have a glass of red every night with dinner. Medicinal, I tell myself. So on the idea that wine is like art…you know what you like, I visited Town and Country Liquors. Near the front door there are always cases of wine and nothing is more than $11. I wondered if I could find a decent red, that I liked, in that price range. My director friend, Talley Wilford, works there. (When you’re a writer or a director you need a day job unless you’re retired from income producing employment like me.) So I asked Talley for some recommendations. This is what he came up with and I did a wine tasting. I opened all three bottles and let them breathe. The Dancing Bull had an odd after taste. I couldn’t figure out what it was, but I didn’t like it. The Zin Your Face was a little better, but had the same after taste. The third bottle, 19 Crimes, was the best of the lot, but I now had three open bottles of red wine that I really didn’t want to drink. None of them had the fruity, jammy flavor I wanted. Sorry, Talley. What to do? My solution was to add a little Creme de Cassis to each glass. It took me awhile to finish off those three bottles. Some big splashes (without the Cassis) went into a pot of red sauce I was making. While I had the Cassis out, I wondered if I could add a little to a glassful of Pelligrino. Voila! A nice treat without the calories of wine. 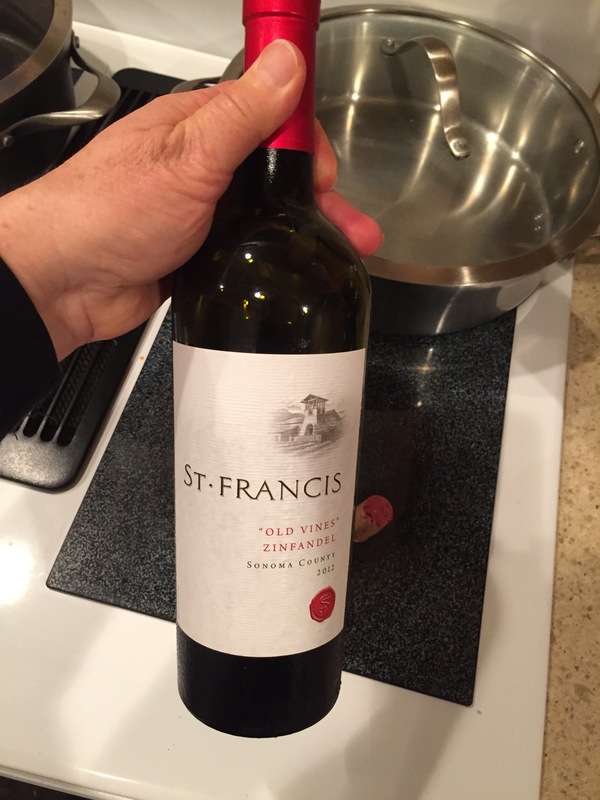 My husband went back to Town and Country and stocked up on St. Francis Zinfandel. It has to be the Old Vines. 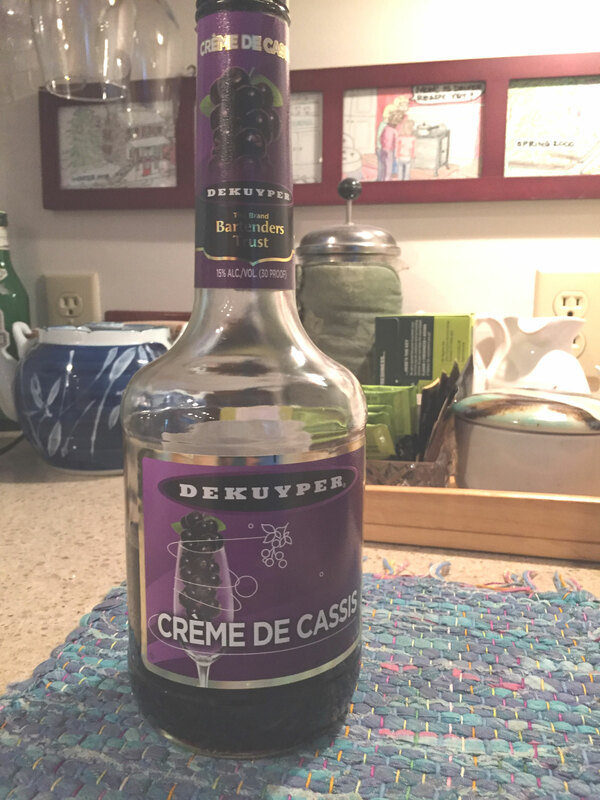 Not as cheap as the $10 bottles, but I didn’t have to add Cassis. And not as expensive as the Rombauer. If you’re a red wine person, tell me what your favorites are. And if you are a wine snob and hate the idea of somebody putting Cassis in wine think Kir. Is the Romance in the Meadow over? Our young couple now has twins. No sleep for awhile. The children – a boy and a girl – are named Mikey and Susie.They could have had more creative names, but I was not consulted. I think the boy should have been named Joaquin since he was born during the hurricane after labor was brought on by his mother lying on her back under a tractor in the rain for several days. 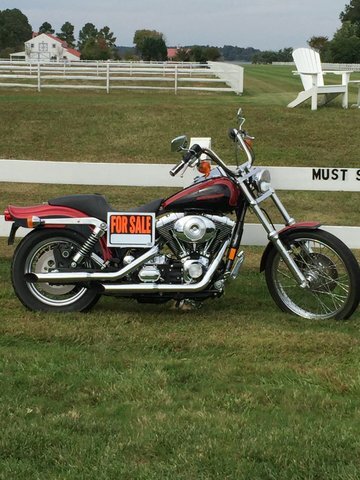 The scooter is for sale. MUST SELL! A double stroller and tricycles are the future. 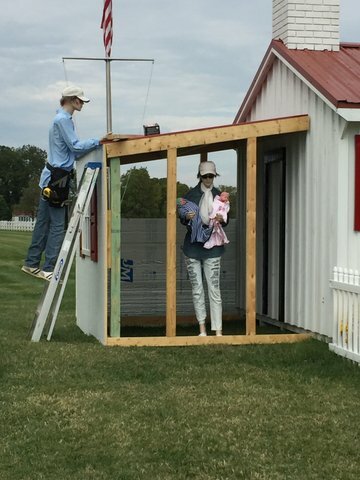 Dad is building an addition. Even so, this is a tiny house. 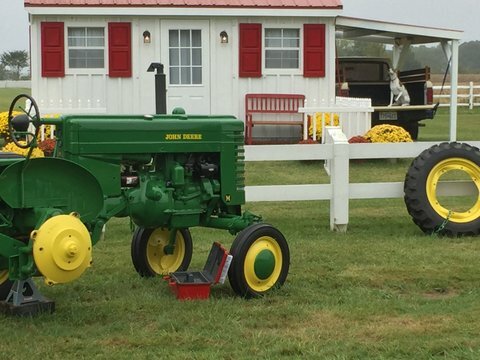 Put it on wheels and it could be on HGTV. Mom has her arms full, and the dog is eclipsed. Where will the story go? I predict the babies will have grown to at least toddler size by Halloween and there will be trick or treaters at the door. The Romance in the Pasture continues as a visibly pregnant wife was seen standing by the fence. I have a feeling this gestation will be brief as it would be pretty boring to see the wife pregnant for nine months. 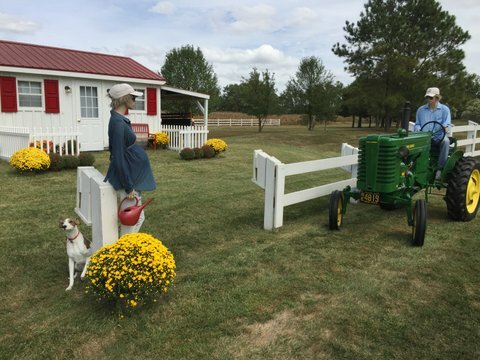 Then we see her and her husband under the tractor. Oh, wait, that’s not her husband. 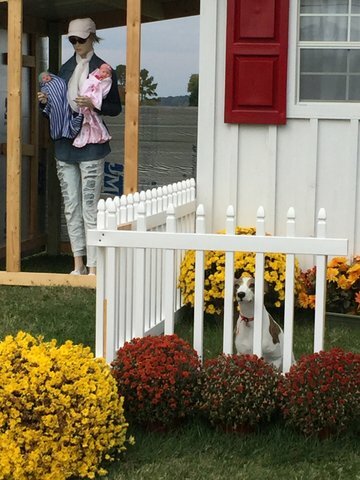 He’s on the porch petting the dog. 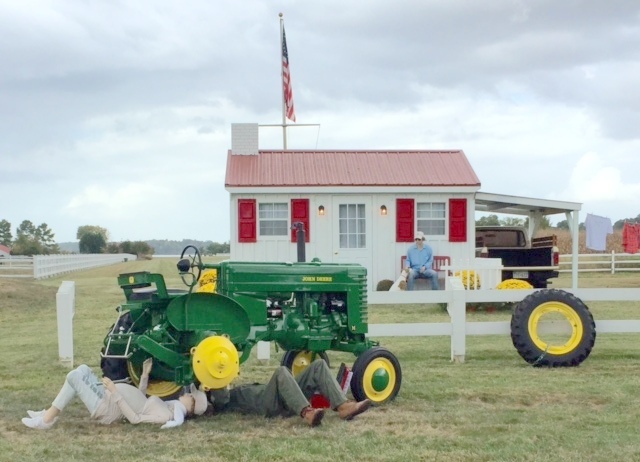 It’s the repair guy under the tractor with the pregnant lady. Hmmm. Is there a backstory here? And didn’t they check the weather forecast? Hurricane Joaquin is on the way. I drove past several times with the two of them on the ground in the pouring rain as we got the feeder bands from Joaquin. “Get your wife inside,” I thought, and drove on. This morning I drove to Easton and was going to stop for a photo on the way back. By that time the couple had taken shelter. Or maybe the wife has gone into labor. The tractor is still awaiting repairs. I noticed the wheel was chained to the fence. I suppose so no one steals it. And that tool box must be full of water. And last night on my way to my Working Writer’s Forum in Easton the tractor was gone. We’ll keep watching how the story unfolds. Anybody want to suggest names for the baby? I wonder if the cottage will be decorated for Halloween? Will the couple wear costumes? Google tells me that the trendiest Halloween costumes for 2015 include Wendy Davis, and Donald Trump. Whatever happened to Star Wars, The Minions, super heroes, and Disney princesses? Or pirates and ghosts? 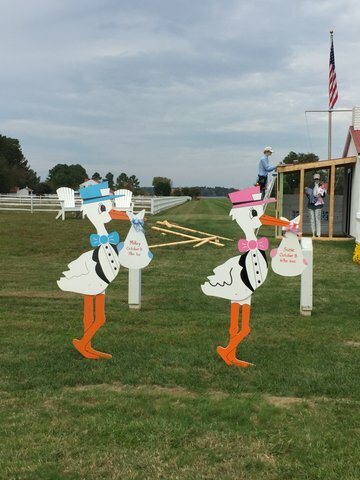 What do you think the couple in the pasture will wear for Halloween?